My predictions for the final regular season standings as well as the major annual awards. The “Dark Horse” predictions are my “not as likely but could happen” picks. Short list: I’m not sure whether I’d nominate the Swarm GM (whoever that is) if they do well, since I think I could have drafted just as well with that many first round picks in a draft that deep. A short summary of each team’s offseason moves, where I think they will end up in the standings, who might have a breakout year, and as always, a haiku for each team. I covered the East yesterday, today it’s the West. Lost Evans, McBride, Pollock, Snider, Moleski, and Veltman and replaced them with Tyler Digby, a bunch of rookies, and a third goaltender. And they only have one person on their practice roster. If the rooks step up big, they could be OK but given their struggles last season with those big-name guys, this could be a scary season for the Roughnecks. Then again, a few years ago the Roughnecks lost both Tracey Kelusky and Josh Sanderson in the off season and replaced them with Daryl Veltman and a rookie named Curtis Dickson. Everyone thought it would be a disaster but they went on to win the West with the best record in the league. Wes Berg. My pick for ROY. You can’t replace Shawn Evans, but Berg will certainly give it a shot. The Mammoth are down Drew Westervelt and Alex Turner (91 points) but Callum Crawford (on pace for 80 last year) should make up for most of that. They also have Ilija Gajic returning; ironically they signed him as a free agent right after cutting Bob Snider, the guy they traded Gajic for. They also released Dan Ball and Ian Hawksbee and lost Cam Flint and Tyler Codron to injury. John Gallant, the only remaining original Mammoth, didn’t play much last season so his retirement won’t have a huge impact. They did sign Greg Downing from the Swarm and added a group of rookies. Ilija Gajic. He and Joey Cupido will make a pretty awesome transition team. Same team as last year, plus Curtis Knight. The west is theirs to lose. Not much more to say than that. Ben McIntosh was third on the team in scoring last year but I can see him leaping over Robert Church into second. Not sure he’ll surpass Mark Matthews though. Lost Digby but added Billings. Added Beers, Moleski, Cornwall, and Hawksbee. Lost Hass and Rory Smith but only temporarily. So far, the most improved team in the league. But they also lost Tyler Richards. Eric Penney has played 346 minutes in his career with a GAA of almost 15. Chris Levis hasn’t played an NLL game since January 25, 2013 – almost three years. If the goaltending doesn’t pan out, they may need to score 16 goals a game to have any chance of success. The Stealth had 5 guys named Tyler on their team last season, but they’re starting 2016 with only one. Can they survive? Garrett Billings. Hardly an out-on-a-limb prediction, but 2015 was very un-Billings-like. With extra recovery and practice time plus playing in his home town with Duch, Schuss, Small, and McCready I think Billings will be back to his Toronto Rock level of dominance. A short summary of each team’s offseason moves, where I think they will end up in the standings, who might have a breakout year, and as always, a haiku for each team. We’ll start with the East, then cover the West tomorrow. Obviously the biggest news for the Bandits is the retirement of John Tavares. But with only 32 points in 10 games last year, he wasn’t having nearly the impact on the offense that he used to. Dhane Smith and Ryan Benesch are the anchors of that offense now. They did add Daryl Veltman, who averaged 53 points a year over his five years in Calgary. Andrew Watt is injured, Derek Suddons is in New England, David Brock is on the practice roster, and Chad Culp is suspended for one game. The Bandits have four rookies on their roster. Smith and Benesch already make a formidable scoring combo, but adding Daryl Veltman will give them another weapon. He had somewhat limited playing time being behind Evans, Shattler, Dickson, and Dobbie but in Buffalo, Veltman could see a jump in both his playing time and numbers. Josh Gillam returns after missing last season, Drew Petkoff signed as a free agent, and the Swarm have a bunch of big-name rookies joining their ranks including first rounders Randy Staats, Jesse King, and Chad Tutton as well as first overall pick Lyle Thompson. None of these four have a single NLL game to their credit but given their pedigrees, I imagine opposing teams are still concerned about facing them. Adding Staats, King, Gillam, and Thompson to an offense that already includes the likes of Johnny Powless, Kiel Matisz, Shayne Jackson, and Lyle’s brother Miles could make for a pretty potent offense. Only one goalie on the roster for now, but Brodie MacDonald will likely be moved from the PUP list by the time opening day rolls around. Lyle Thompson is the obvious choice, and I’m sure he’ll have a great season. But at the Rock / Swarm preseason game in December, I heard the name Randy Staats an awful lot as well. Either one of these guys is my choice for the Swarm. Or Jesse King. Fourth in east but if I had to pick one NLL team to be the dark horse, it’d be the Swarm. The Black Wolves pulled off a pretty big trade in getting Kevin Crowley back from Toronto, and then a huge trade in grabbing reigning MVP Shawn Evans. Adding these two guys, even at the expense of losing Garrett Billings, should make your team better, and I think it has. And don’t underestimate the value of a vet defender like Derek Suddons. But half of the announced Black Wolves roster wasn’t on the team at the end of 2015. Add to that a new coaching staff and a last place finish last year and my expectations aren’t all that high for the Black Wolves. Shawn Evans is one of the game’s best players and has an outstanding work ethic, and so maybe some of that will spur the team on to great things. But someone has to finish last and for me, there’s too much uncertainty here to rank them any higher than that. The Black Wolves have a new head coach in Glenn Clark, and Hall of Famer Jim Veltman joins Clark and Tracey Kelusky as an assistant coach. Blane Harrison resigned as head coach after last season, saying that his family moved to Michigan and the travel would be too difficult. Makes sense, except for the fact that he’s now an assistant coach with the Georgia Swarm. Quinn Powless only played 3 games last season before an injury ended his season, but he’s back and healthy and could have a big impact this year. Not many, but one could be pretty substantial. Brad Self is on the shelf (see what I did there?) as is Angus Goodleaf, Zac Reid is in New England, and Colin Boucher is out. 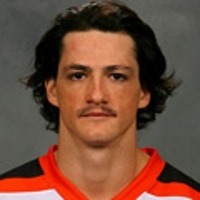 But I’ve heard great things about #2 overall pick Graeme Hossack. Not that the Knighthawks had serious defensive problems, but can you ever have too much defense? Brandon Styres (the son of owner & GM Curt Styres) is the new backup goaltender but when you’re backing up a workhorse like Matt Vinc, don’t expect to see a lot of floor time. As a defender, Hossack won’t make the score sheet often but he was chosen ahead of guys like Wes Berg and Randy Staats for a reason. Not a lot of changes for the Rock, but one could be either a temporary setback or a significant blow to the offense. Josh Sanderson, coming off a 102-point season (his best in 5 years), has announced that he will not begin the season on the active roster since he’s not physically ready to play. If this lasts just a few weeks before he’s back, I’m sure the Rock offense can step up in his absence. But he’s also hinted that this could mean retirement, in which case the Rock are down 102 points from last season, the vast majority of which were assists. Kevin Crowley was also returned to New England after effectively being borrowed for the last 1/4 of the season and the playoffs. In return, the Rock got forward Dan Lintner, who I was pretty impressed with in the exhibition game against Colorado in mid-December. At 5’9″, he’s not a big guy but was a dynamic player and when you’re replacing Josh Sanderson (as much as a future hall-of-famer like Sanderson can be “replaced”), you don’t need to be big. Also joining the offense is Turner Evans, a cousin of Shawn and Scott. Evans is also not a big guy (also 5’9″) but he picked up a couple of goals and a bunch of assists in the pre-season. It wouldn’t be considered a “breakout season”, but Brett Hickey has looked outstanding in the pre-season, scoring 14 goals in the Rock’s three games, putting him on pace for 84 goals in 18 games. This is supremely unlikely, but I think he could certainly break 50 again in the regular season. All of the roster changes in one article! That’s why you pay the big bucks to read this blog. Note that these are the changes as of the final roster from last season, so a player might be listed as “In” even if he played for that team during last season. The first ever Bandits roster with no Tavares. Culp is only out for one game. The Swarm only have one goalie on their roster for now, but Brodie MacDonald says he’s only out for a short while with a chest cold. Wow, huge turnover from the Black Wolves / Wings organization! Who saw that coming? Can you imagine? An NLL GM signs his own son! Crazy. The loss of Josh Sanderson is huge for the Rock – with respect to JT, likely the biggest loss for any team. That’s a lotta big names replaced with Tyler Digby and a group of rookies. Lots of changes in Colorado as well but adding Crawford and Gajic strengthens an already-strong offense. Wow, very little turnover from the defending champs! Who saw that coming? Possibly the most improved team on paper, except at goaltender. No disrespect to Eric Penney and Chris Levis, but replacing Tyler Richards is a pretty tall order. There was a conversation on the IL Indoor message boards recently about Chris Corbeil and how he was traded to the Rush from the Buffalo Bandits. A Bandits fan was unhappy that Corbeil is now the captain of the reigning champs, while the Bandits got draft picks in return. I looked it up and found that the Bandits didn’t get quite as screwed as it might seem. That was fun so I thought I’d look up a few other trades from a few years ago. Now that we know which players played well, which were busts, and which players were drafted with the picks that were exchanged, we can see how they ended up working out. I just randomly picked a bunch of trades that involved draft picks. This was not planned, but all but one of these trades involved the Edmonton Rush. 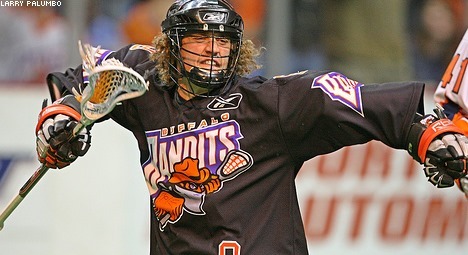 September 9, 2011: The Bandits sent Chris Corbeil to the Rush for a 2nd round pick in 2011 and a 1st round pick in 2012. Four years after this trade, Corbeil is one of the premiere defenders in the league and as stated above, the captain of the defending champions. Did the Bandits get fleeced? Not at all, as it turned out. The second round pick in 2011 turned out to be Jeremy Thompson, but the Bandits traded the first round pick (3rd overall) to Minnesota who used it to draft Kiel Matisz. In return, the Bandits got Brendan Doran, Shawn Williams, the 5th overall pick, and two later picks. The Bandits drafted Dhane Smith and Carter Bender and traded the other pick to the Rock for Glen Bryan and Jamie Rooney. Doran never played for the Bandits and Bender scored 3 points in 3 games. But Bryan, Rooney, and Williams each played two seasons in Buffalo and Dhane Smith is one of the Bandits top offensive weapons. 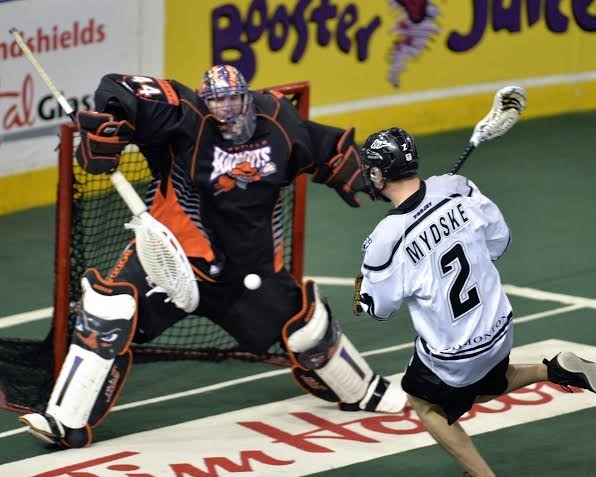 Thompson played in 14 games for the Bandits in 2012, scored 9 points, won 46% of 140 face-offs, and was traded to the Rush a year later (see below). Winner: Corbeil vs. Dhane Smith, two years of Williams, Bryan, and Rooney plus a year of Jeremy Thompson? Calling it for Buffalo. 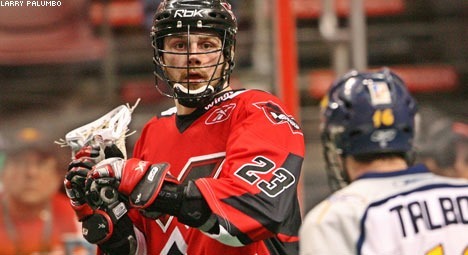 February 10, 2012: The Bandits sent Jeff Cornwall to the Rush for a 2nd round pick in 2012 and a 2nd round pick in 2014. The second round pick that the Bandits got in 2012 was Jordan Critch, who scored five points in five games in 2013 and hasn’t played in the NLL since. The 2014 pick got complicated. In July 2013, the Bandits traded that pick, a second round pick in 2013, and Carter Bender to Colorado for Rory Smith and a 4th rounder in 2015 (Tim Edwards). Colorado ended up trading the pick to Calgary for Jackson Decker, and Calgary drafted Tyson Roe. The end result for the Bandits: they gave up Jeff Cornwall for 5 games from Critch, a season of Rory Smith, and Tim Edwards. Rory Smith was later sent to the Stealth along with Eric Penney for Nick Weiss and even more draft picks, but that’s as far as I think I want to go with this one. Winner: Hard to determine since the picks got pretty complicated but I’d go with Edmonton. 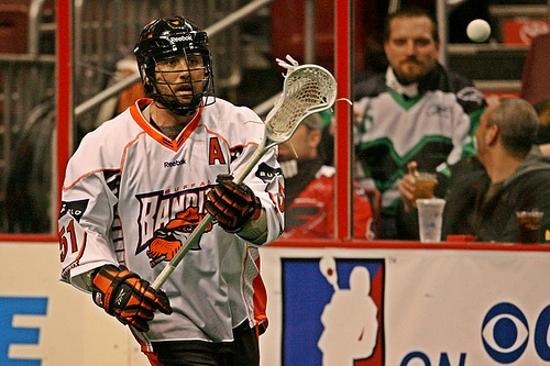 February 16, 2012: The Swarm sent Anthony Cosmo to the Bandits for 1st round picks in 2013 and 2014. Anthony Cosmo was picked up by the Swarm in the Boston Blazers dispersal draft despite the fact that he told them he wouldn’t play for them. He was true to his word and didn’t play, but they held onto him for part of the 2012 season until the Bandits came calling. The Swarm love those first round draft picks and Buffalo offered some, so Cosmo was sent east. In 2013, their pick from Buffalo turned into the first overall pick, which became Logan Schuss. In 2014, it was #5, Shane MacDonald. Schuss scored 104 points for the Swarm in a year and a half before being traded to Vancouver for Johnny Powless, while MacDonald scored 13 points in 11 games last season and has since been traded to New England for Drew Petkoff. Winner: Cosmo vs. Schuss + Powless. Another tough call but I have to give this one to the Bandits. July 25, 2011: The Rush sent Ryan Cousins, Andy Secore, and Alex Kedoh Hill to Rochester for Shawn Williams, Aaron Bold, and a 2nd round pick in 2012. The second round pick that the Rush received was traded to the Stealth along with Athan Iannucci for Paul Rabil and a first rounder. The Stealth drafted Justin Pychel with that pick, while the Rush picked Mark Matthews. The Rush later traded Rabil to the Knighthawks for Jarrett Davis. The Knighthawks sent Rabil (and others including Jordan Hall) to the Wings for Paul and Dan Dawson. Cousins played 10 games for the Knighthawks before retiring. Secore never played again, while Hill played 5 games with the Knighthawks before being sent to the Bandits. Shawn Williams played one season in Edmonton before being sent to Buffalo via Minnesota. Aaron Bold, I believe, is still with the Rush. Winner: From this trade, the Rush ended up with Aaron Bold and a season of Shawn Williams. Add in the Iannucci deal (below) and the draft pick turned into Mark Matthews. I’d call Edmonton the clear winners here. November 14, 2012: The Bandits just love sending players to the Rush. This time, it’s Jeremy Thompson for Aaron Wilson and a 2nd round pick in 2013. The second round pick was Nick Diachenko, who never played for the Bandits but was picked up as a free agent by the Rock. Thompson is one of the best transition players in the game. 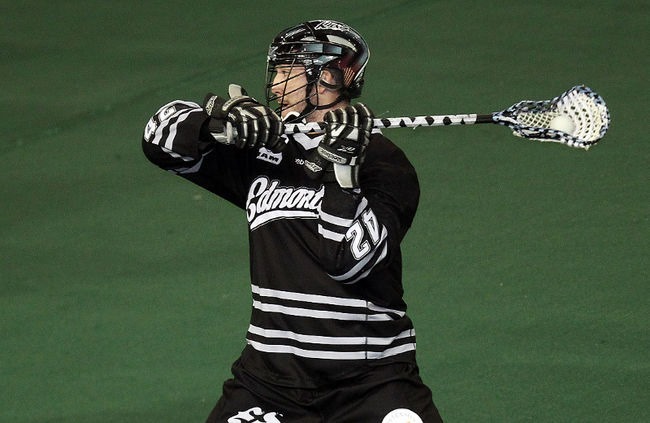 Aaron Wilson scored 59 points in a year and a half with the Bandits before being sent to the Knighthawks. He only played 4 games last year and retired in the off-season. Winner: Rush again but the Bandits did OK here. August 9, 2011: The Rush sent Brodie Merrill, Mike McLellan, Dean Hill, the 41st overall pick in 2011, and a 4th round in 2013 to the Wings for Athan Iannucci, Alex Turner, Brodie MacDonald, and 1st round picks in 2012, 2013, and 2014. This was one of the biggest blockbuster trades of the last decade. Merrill had already been named Defender of the Year once and Transition Player of the Year twice, while Iannucci set the single-season goal-scoring record. Not only does his record of 71 still stand, only four people have come within 20 goals of that number in the 7 seasons since. The picks involved: The 2011 pick ended up in Buffalo (not sure how it got there), who drafted Dwight Bero. The Wings got goalie Don Alton in 2013. Edmonton’s 2012 first rounder went to Buffalo (for Chris Corbeil – see above) and then Minnesota (for the Dhane Smith pick and Shawn Williams – see above) who turned it into Kiel Matisz. The 2013 first rounder was Robert Church. The 2014 pick was sent to the Swarm with Brodie MacDonald for Tyler Carlson, the first overall pick in 2014 (Ben McIntosh) and a second-rounder in 2015 (Dan Taylor). Merrill had three very good seasons with the Wings before being traded to the Rock. McLellan scored 7 points in 11 games with the Wings in 2013 and hasn’t played in the NLL since. Dean Hill never played with the Wings, but played 40+ games with the Stealth, Mammoth, and Swarm before retiring this past off-season. Alton played one minute in one game, got scored on, and retired with a career GAA of 60.00. Edmonton’s picks turned into Corbeil, Church, and Tyler Carlson, all of whom are still on the Rush. Alex Turner scored 25 points in two seasons before being traded to the Swarm for a draft pick (later traded to Calgary for Matthew Dinsdale). After scoring 71 in 2008, Nooch never again got within forty goals of that record. He blew out his knee after the 2008 season and hasn’t been the same player since, never scoring more than 29 goals in any season. He refused to report to the Rush and was traded to the Stealth for Paul Rabil and a first rounder, which turned into Mark Matthews. Winner: Edmonton by a landslide. The end result from all this analysis: Derek Keenan (who was the Edmonton GM for all of these deals) is pretty good at his job. Shoutout to John Hoffman (@Corporal763) for his awesome site swarmitup.com, which contains unbelievable detail about every NLL draft.